The NSX’s stock 155lph fuel pump reportedly maxes out around 400whp which will not suffice for our turbocharged 500whp+ goal. We upgrade the factory pump with the new Walbro 416 E85 compatible fuel pump and visit our friends at Brown and Miller Racing Solutions for motorsport-grade alcohol approved fuel lines, fittings, and electrical wiring. We finish the build by taking our hanger to be PTFE coated by Calico coatings. In Part 5, with only headers, exhaust, and some intake manifold work, our Project NSX produced an impressive 269whp which equates to ~315bhp from our naturally aspirated 3.0L C30A motor. 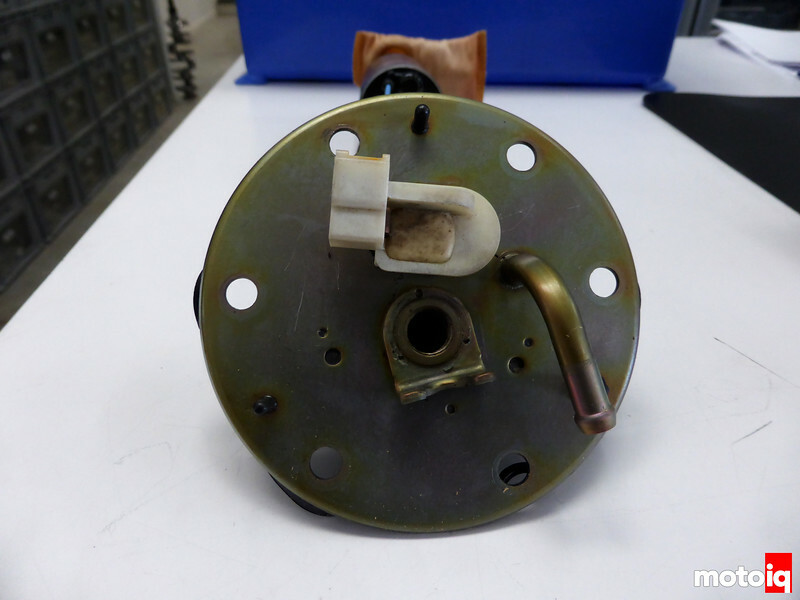 With the turbo motor coming together and plans to almost double the power that we've already made, our stock 155lph fuel pump is not going to be up for the challenge. Just like an open-wheel racecar or purpose built prototype, the NSX’s fuel cell is located low to the ground and between the driver and the engine. This is in an ideal location for center of gravity, center of mass, and has very little effect on the car’s balance as fuel is used. While the NSX’s fuel tank is in an ideal location for performance, servicing anything pump related requires dropping the entire fuel cell which is not an easy task. Since we are not sure if the car will ever run on E85, we decided to build it right the first time and make everything compatible to run on both E85 and Alcohol just in case. The stock fuel pump hanger assembly is tall and has a 45* angle on it to correspond to the tall, but narrow fuel tank. The fuel filter ‘sock’ is a bit ragged and the steel has some buildup on it after two decades of use. Fuel is pressurized from the pump and is sent up the steel tube to the top of the hanger. From here, a banjo-fitting takes the fuel from the hanger to the fuel rail. 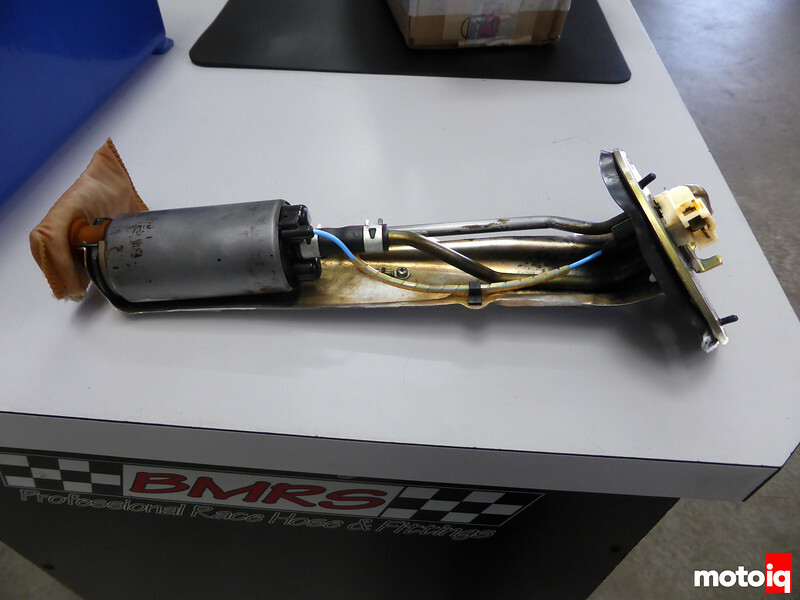 The white connector sends power through the bulkhead of the hanger top to the fuel pump, and the bent tube on the right is the fuel return line. 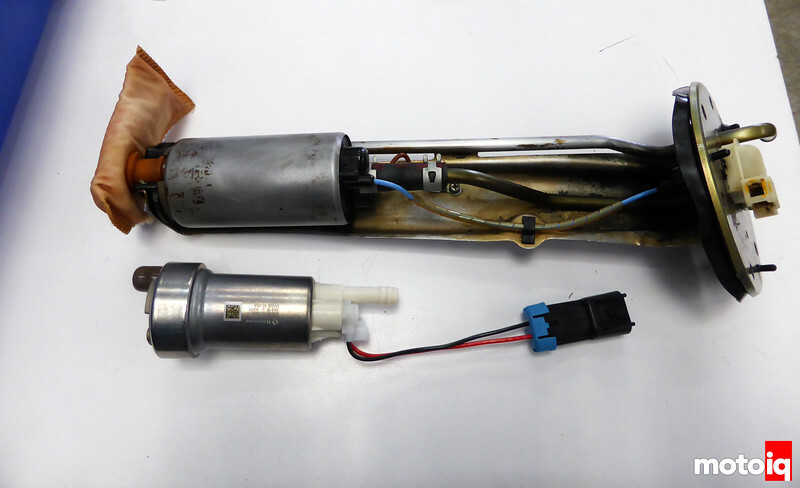 Here we see the new Walbro 416 E85 compatible fuel pump next to the stock NSX fuel pump. 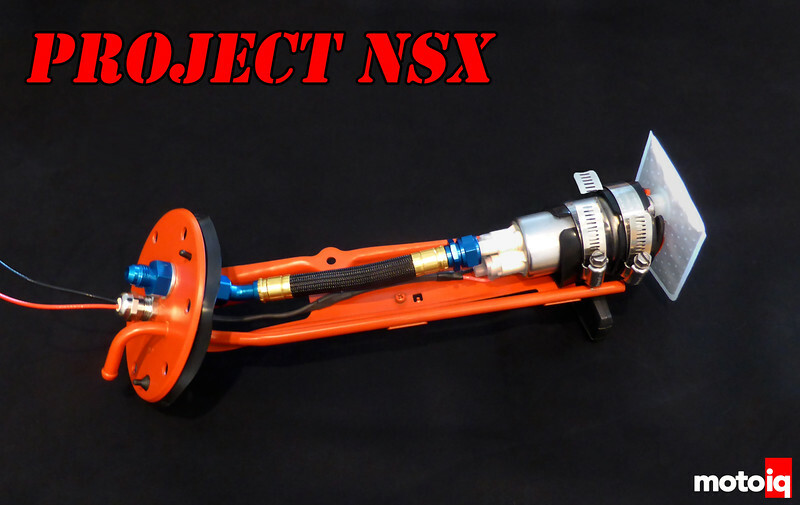 The wide base of the Walbro is the same diameter as the entire NSX pump. This is the difference 20 years makes.